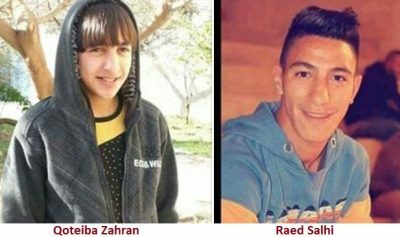 The Israeli military transferred, Friday, the corpses of two Palestinians, who were shot dead by army fire last month, in Tulkarem and Bethlehem, back to their families. On Friday evening, the soldiers transferred the corpse of Qoteiba Zahran, 17, to the Palestinian side at military roadblock #104, west of Tulkarem city, in the northern part of the occupied West Bank. His body was then moved to Dr. Thabet Thabet governmental hospital, where his family and hundreds of Palestinians, including the governor of Tulkarem, and dozens of security and police officers gathered. Zahran will be buried in his town, ‘Illar, north of Tulkarem, on Saturday. He was shot dead by Israeli soldiers on Saturday August 19, 2017, at Za’tara military roadblock after they claimed that he attempted to stab them. Furthermore, the army transferred the body of Ra’ed Salhi, 21, to his family in Deheishe refugee camp, south of Bethlehem. The Bethlehem branch of the Red Crescent said its teams received the body at military roadblock #300, north of Bethlehem, and moved it to Beit Jala governmental hospital, where hundreds of Palestinians gathered. Salhi was shot and seriously injured by army fire, on August 9th, 2017, when the soldiers invaded Deheishe refugee camp, south of Bethlehem, while another Palestinian, identified as Abdul-Aziz Ahmad Arafa, was injured and taken prisoner by the soldiers. After shooting him, the soldiers left Salhi bleeding without any medical attention for more than ninety minutes, and later moved him to Hadassah Israeli Medical Center in Jerusalem, where he died from his serious wounds, on Sunday September 3.